It was a cold February night in the year two thousand and twelve. Adventurers all across the world were mining, crafting and exploring with joy; and the builders relished in the newest feature - creative mode. But one group stayed out, cold and alone - nobody understood why they built those boxes of blue and plungers of stone. "The whovians" they called themselves, with fezzes on their skins and sticks in their hands. They had nowhere to be, and nowhere to build; a lone griefed dalek the only sign that one of them had ever visited a world's destroyed landscape. And it was on that one cold night that one community - itself a survivor of the lone wilderness years known as... the nineties - decided this could not stand. It should not be right that so many lost players should have nowhere to build their obscure references to an episode nobody remembers. And so it came to pass that through the evening and the dark of the night, a new world did appear - a world by the name of "Doctor Who Online". Time began to pass, and more and more of the Whovians heard of the place. What had started as a fiery landscape of grief had turned to cobble, and the world of Doctor Who began to thrive there. Five years passed, and in what once was a desolate landscape now stands a city, surrounded on all sides by constructions, builds and artwork from thousands of dedicated players - without whom this place, this Doctor Who Online, would not exist at all. 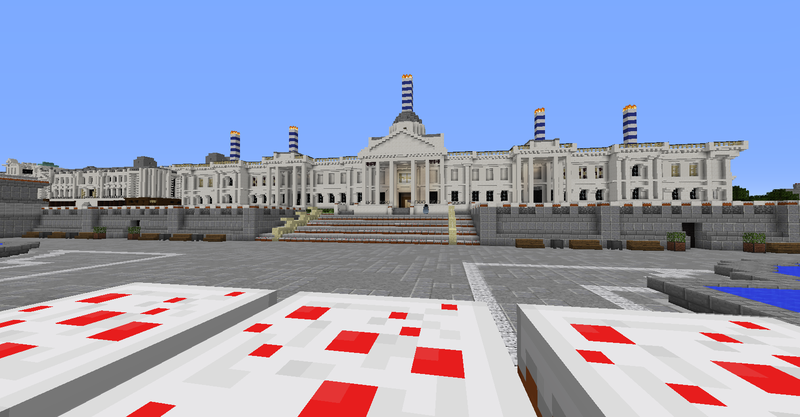 So yes, it finally happened - today marks the fifth year since our Minecraft server first opened its doors. In that time it's fair to see we've seen literally everything, and done more than I ever imagined - from builds to events to games to time machines to theme parks. But none of that means anything without the other thing that's been here for all five of those years - the players. Without you guys, this stuff just doesn't exist. Without the generosity of those of you who have helped to keep us running so long, we just wouldn't be. And without the generosity of those who just spent some time on the server, nobody else after you could have either. Thank you to every single person who just clicked on to have a little look around, and thank you to those who decided to stay. Thanks to those of you who stepped up to help us run the place, and for dedicating dumb amounts of your time to making sure that happens. And thanks to those that were never asked, but dedicate that time regardless. So today isn't really our birthday, it's all of ours. It's the fifth year that you guys have kept coming back, and it's only right that we give something back too. So today, it's time for a proper bananza - we'll be hosting our first ever All-Star Celebrity Big Money Round Jumbo Deluxe Edition Games Night! On Ice! With no celebrities! Tonight, join us in Trafalgar Square at 10pm GMT (that's 5pm EST or 2pm PST!) to blow out the candles on our gigantic London sized cake! Unfortunately due to the size of the candles (I bought them online and they didn't add a picture...) we're gonna need some help to blow them out. The more of you we can get online to help us blow, the better chance we've got - let's see if we can't beat our player record! Then we'll be heading to the Games World for a night of ruthless slaughter family fun! But tonight, it's with a difference - we'll be awarding prizes to those of you who do best! For every game that you win - be it just you in Build Battle, or your whole team in Gang Wars - we'll award you with GBP0.50 credit for our Buycraft store. The more games you play and the better you play them, the higher your birthday jackpot becomes. Who knows - maybe the best players might even be able to get themselves Cardinal as a birthday present? Let the best players win! Also, we've got a new forum thread for sharing your favourite photos, moments and memories from the five years past on the server - head over there to post them and see what everyone else has added! So to recap: 10pm tonight, Trafalgar Square. Be there, or be stuck at 4 years old forever!